The South Korean navy has raised the stern section of one of its warships which sank after an unexplained explosion last month. 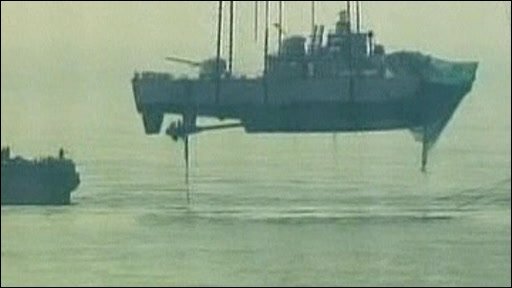 Fifty-eight sailors were rescued at the time of the sinking, which occurred near the sea border with North Korea. It is thought the bodies of more than 40 missing crew are trapped in the shattered hull of the corvette. The Cheonan, a 1,200-tonne navy gunboat, sank in mysterious circumstances three weeks ago. Officials are trying to determine the cause of the explosion; reasons range from accident to attack from the North. South Korean officials said the stern section would be taken by barge to a naval base for a thorough investigation. Early on Thursday, a giant floating crane winched the stern of the ship up from the sea bed. Once it has been drained of water it will be examined to try to determine the cause of the blast. South Korean TV stations are broadcasting images of the salvage operation, with camera crews kept at a safe distance because this section of the ship is thought likely to contain many of the bodies of the missing crew members. The Cheonan sank close to the sea border which marks North and South Korean territorial waters. South Korea has been careful not to level any direct accusations against the North, but it is also very clearly not ruling out the possibility that the ship was attacked, reports the BBC's John Sudworth, in Seoul. President Lee Myung-bak has called for an objective investigation, the findings of which must be beyond dispute, followed by "stern measures" against whoever was to blame. South Korea's defence minister has renewed speculation a torpedo could have caused the blast. Kim Tae-young said it was a "likely possibility" the Cheonan had been hit by such a missile, but that all possibilities needed to be considered. Pyongyang has made no official comment on the incident. It does not accept the maritime border, known as the Northern Limit Line, which was drawn unilaterally by the US-led United Nations Command at the end of the Korean War. The sea border has been the scene of deadly clashes between the navies of the two Koreas in the past.